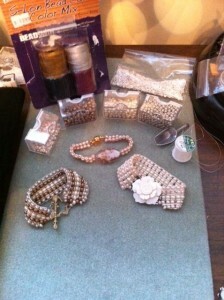 I have really enjoyed work­ing on the Ricks Bead­ing Loom with the Miyuki Baroque Pearls. I used sizes 5 and 6 to cre­ate these pieces. Since using such large round beads can tend to make the piece ‘thready’, I used that to my advan­tage by warp­ing the loom with more inter­est­ing threads. I used sil­ver S-lon for the tri-colored bracelet with the but­ter­fly clasp. 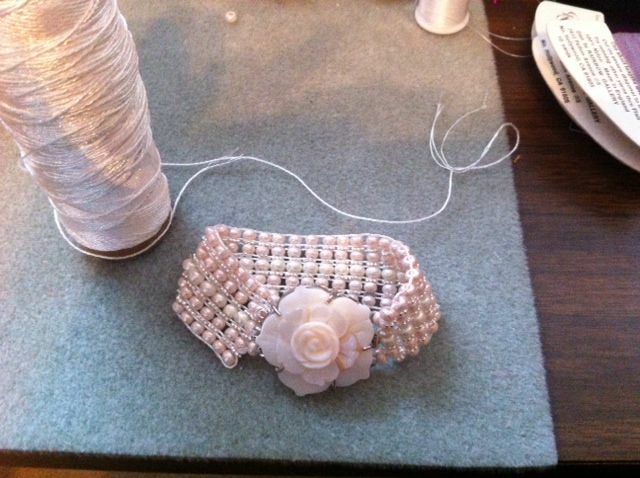 The white/pink bracelet was an exper­i­ment using a pearl­ized cot­ton cro­chet thread that I’ve been dying to try as warp thread. It worked well, but like S-lon, I coat the ends with clear nail pol­ish before try­ing to thread it into a yarn nee­dle to make the knots as I tie off the warps. Daisy spac­ers are a nice com­pli­ment to these lus­trous beads. I was happy to finally design pieces suit­able these clasps and the oval lam­p­work focal bead I have saved for sev­eral years. The but­ter­fly clasp was not just the right shade for the bronze pearls, so I tinted it with bronze Ranger Per­fect Pearls pig­ment pow­der. I’ve worn the bracelet sev­eral times now and notice no rub­bing off of the pig­ment, so maybe it will hold! The heft of these bracelets make them feel good on my arm and the tex­ture of the mate­ri­als shows off the Baroque Pearls! 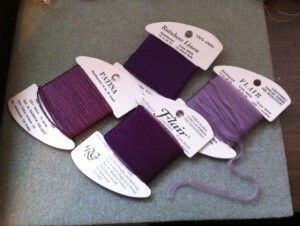 Like Paul says, any­thing with a hole in it can be loomed on the Ricks Bead­ing Loom! Love that loom!